The name Poggio Alloro means Bay Leaf Hill, and it refers to the bay laurel bushes that grow everywhere on our property. 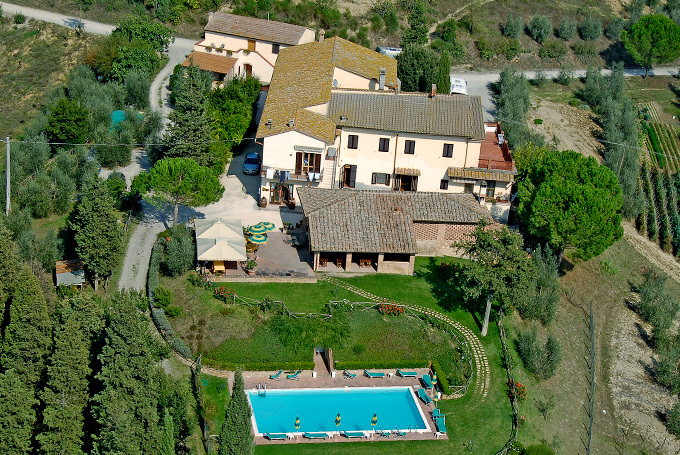 It is situated only 5 km away from San Gimignano, surrounded by rolling hills and lush fields. The towers of San Gimignano on the horizon complete this extraordinary picture. The farm is still a family business, in which parents and children work every day, side by side. At the present time, the farm consists of one hundred hectars and it is completely organic. On twenty four hectares we grow grapes varieties such as vernaccia di San Gimignano (a local grape that grows only in this town), sangiovese (to produce the famous Chianti wine), canaiolo, colorino, malvasia and trebbiano (for the traditional Vinsanto sweet wine). In small part, we also grow chardonnay, cabernet, and the merlot varieties. On another fifty hectares we raise grains such as barley, oats, corn, sunflowers, durum, wheat, and farro to produce the delicious durum, semolina and farro pasta. Scattered all over the property, 1500 olive trees give us the excellent extra-virgin olive oil. The olives are completely hand picked in November, and then cold pressed to guarantee the superior quality of this product. The garden and the orchards offer us organic fruits and vegetables that we use in our restaurant for the traditional Tuscan recipes. Some of our dishes are also enriched by the precious saffron, also know as “the gold of San Gimignano”. In November our small saffron field fills with stunning lilac flowers and the harvest begins! The farm’s two woods, provide firewood for the winter. In one of these is also the site of thirty beehives, where thousands of industrious bees produce the delicious wildflower honey. In our Agriturismo, located only 5 km away from San Gimignano, you will find our simple, friendly and sincere hospitality, in the breathtaking scenery of the Tuscan rolling hills.